^ “Ammonium Salts”. VIAS Encyclopedia. 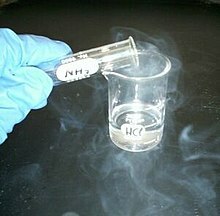 http://www.vias.org/encyclopedia/chem_ammonia_salts.html. ^ Campbell, Neil A.; Jane B. Reece (2002). “44”. Biology (6th ed.). San Francisco: Pearson Education, Inc. pp. 937–938. ISBN 0-8053-6624-5. ^ Britto, DT; Kronzucker, HJ (2002). “NH4+ toxicity in higher plants: a critical review”. Journal of Plant Physiology 159 (6): 567–584. doi:10.1078/0176-1617-0774. http://www.utsc.utoronto.ca/~britto/publications/amtox.pdf. ^ a b Stevenson, D. J. (November 20, 1975). “Does metallic ammonium exist?”. Nature (Nature Publishing Group) 258: 222–223. Bibcode: 1975Natur.258..222S. doi:10.1038/258222a0. http://www.nature.com/nature/journal/v258/n5532/abs/258222a0.html 2012年1月13日閲覧。. ^ a b Bernal, M. J. M.; Massey, H. S. W. (February 3, 1954). “Metallic Ammonium”. Monthly Notices of the Royal Astronomical Society (Wiley-Blackwell for the Royal Astronomical Society) 114: 172–179. Bibcode: 1954MNRAS.114..172B. http://articles.adsabs.harvard.edu/cgi-bin/nph-iarticle_query?1954MNRAS.114..172B&data_type=PDF_HIGH&whole_paper=YES&type=PRINTER&filetype=.pdf 2012年1月13日閲覧。.